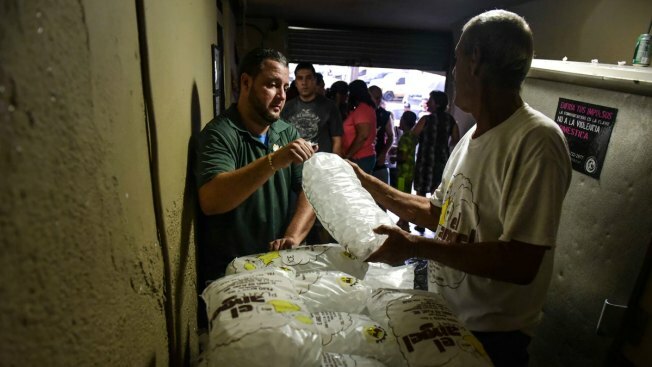 People buy ice during a massive blackout in San Juan, Puerto Rico, on Sept. 22, 2016. Power surges hit Puerto Rico overnight as frustration mounted while the U.S. territory struggled to fully restore electricity more than two days after a rare, island-wide blackout caused by a power plant fire. 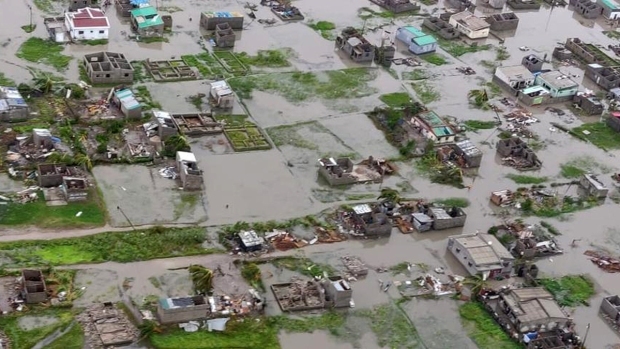 Cheers were intermixed with groans as power came and went during the day, frustrating some who had already stocked up at the supermarket and others who complained that the surges were damaging their home appliances. Roughly 75 percent of 1.5 million homes and businesses served by the island's power company had electricity restored by late Friday, but officials warned that number would keep fluctuating. Around 200,000 of those customers were temporarily knocked off the grid Friday afternoon when a privately run plant failed and caused the temporary collapse of two larger public power plants that it was feeding, said Gov. Alejandro García Padilla. "There may be setbacks that we can't anticipate," he said during a press conference late Friday. Garcia said he expected that the majority of customers would have power by the time they woke up on Saturday. "But, again, this is a very, very ambitious goal," he said, adding: "I want people to start their week without any problems." Javier Quintana, executive director of Puerto Rico's Electric Power Authority, warned that power would come and go given the increase in demand as more customers came online. Both he and Garcia urged Puerto Ricans to be prudent in their use of electricity. Those without power became increasingly disgruntled by Friday afternoon, when the heat index reached 106 degrees and meteorologists announced that a record high temperature was set. Many worried about spending a third night in darkness with no air conditioning or fans. "It's taking way too long," said 74-year-old Magdalena Concepción as she waited at a bus stop. "It's so hard to sleep. I take a cold shower right before going to bed." Most Puerto Ricans don't have generators, and those who could afford it booked hotels offering special rates. The blackout affected the entire island of 3.5 million people and angered many Puerto Ricans already struggling through a decade-long economic crisis. The outage prompted Garcia to activate the National Guard and declare a state of emergency. At least one person died the first night from exposure to carbon monoxide after setting up a personal generator. Meanwhile, four police officers were struck by vehicles while directing traffic but were expected to recover. Localized power outages are common in Puerto Rico given its outdated energy infrastructure, but widespread failures such as this are extremely rare. The Electric Power Authority said it is investigating what caused the fire at the Aguirre power plant in the southern town of Salinas. The fire knocked out two transmission lines that serve the broader grid, which tripped circuit breakers that automatically shut down the flow of power as a preventive measure, officials said. Executive director Javier Quintana said a preliminary investigation suggests that an apparent failure on one transmission line that might have been caused by lightning caused the switch to explode. Garcia denied the blackout was caused by maintenance problems that have plagued the utility for years, largely a result of the island's economic crisis. He said the switch where the fire happened had been properly maintained. It was not yet clear how much damage the fire caused. The utility is struggling with a $9 billion debt that it hopes to restructure as it faces numerous corruption allegations. Company officials have said they are seeking revenue to update outdated equipment.